A bill to block renewable energy standards is the product of an aggressive campaign by conservative groups to undermine laws that encourage the development of clean energy. A sweeping campaign against clean energy is set to collect its first win in Ohio, where lawmakers voted on Wednesday to impose a two-year freeze on the state’s renewable energy and efficiency standards. After initially threatening a veto, Republican Governor John Kasich indicated he will sign the bill. That would make Ohio the first of the twenty-nine states with renewable energy mandates to roll them back. Ohio’s legislation is the product of an aggressive campaign by conservative groups to undermine laws that encourage the development of clean energy. The bill stays requirements that utilities get 25 percent of their power from renewable sources and cut customers’ power consumption by 22 percent by 2025. During the two-year freeze, a legislative commission will consider reforming the standards. The bill weakens them already, just in case they are eventually reinstated. “It’s an example of Ohio returning to the Dark Ages,” former Governor Ted Strickland, who signed the standard into law in 2008, told Bloomberg. Conservative groups laid the groundwork for Ohio’s regressive move in 2012, when the Heartland Institute and ALEC created model legislation to roll back renewable energy mandates. By the end of 2013, lawmakers in seventeen states had introduced legislation to freeze, repeal or gut renewable mandates. Although Ohio is the only state so far where the offensive has succeeded, the campaign is right on schedule: at its inception, the director of ALEC’s energy, environment and agriculture task force told The Washington Post he anticipated successes would come in 2014. The campaign against renewable standards in Ohio followed a standard pattern. Armed with model legislation, conservative lawmakers like state senators Bill Seitz and Kris Jordan— both members of ALEC—argued against renewables using economic analyses produced by research institutes in the Koch brothers’ network—in particular, the Beacon Hill Institute at Massachusetts’s Suffolk University. Then the legislation received a boost from outside groups including Americans for Prosperity (another Koch affiliate) and American Energy Alliance, an advocacy group that has received funding from the Kochs and ExxonMobile. One of the arguments used to attack the renewable standards is the claim that the standards are driving up utility prices, based on the fact that electricity prices in the state have risen faster than the national average. But there are other factors that influence what Ohioans pay for electricity—in particular, the fact that the state is heavily dependent on coal. Nearly 70 percent of Ohio’s power comes from coal, well above the national average. That means that utilities in Ohio are exceptionally sensitive to rising coal prices, a stranglehold that renewable mandates were in part designed to change. 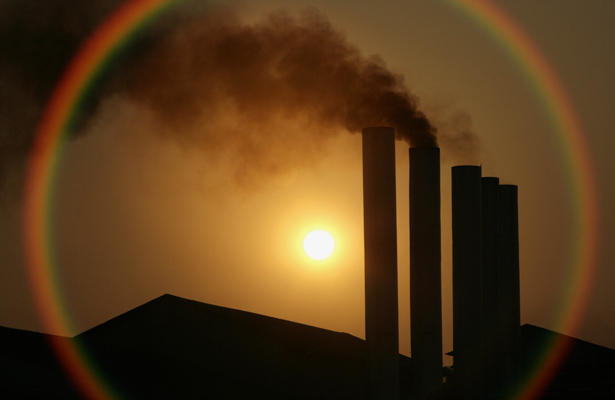 It’s also helped make Ohio one of the top polluters when it comes to power plants. The push for a freeze was led by the Chamber of Commerce and the state’s main utility, FirstEnergy, whose CEO has decried renewable mandates as part of the “war on coal.” But other business groups like Ohio Advanced Energy Economy opposed the freeze, as did corporations like Honda and Anheuser-Busch. The Ohio Manufacturer’s Association warned freezing the mandate “will drive up electricity costs for customers and undermine manufacturing competitiveness in Ohio.” According to recent polling a large majority of Ohio voterssupport the standards, which passed the legislature with just two dissenting votes in 2008. The attacks on state renewable mandates are only one prong of a sweeping conservative assault on clean energy. ALEC, Americans for Prosperity and conservative lawmakers are also targeting homeowners who install solar panels on their homes, via a surtax on the unused energy they sell back to utility companies. More high profile is the fight against the EPA’s proposal to regulate carbon emissions from existing power plants, which President Obama is expected to detail on Monday. The groups attacking renewables say their concerns are economic, and they are—just not in the way they claim. Their priorities are not with consumers struggling with rising energy costs; if that were the case, they would not gut standards that saved Ohio taxpayers more than $1 billion in just four years. They are instead working to further the agenda of fossil fuel corporations, which have a strong financial interest in stamping out the alternative energy market.